The heart attack of this young woman again struck home, too close to home. Last week, we buried our founding member’s son-in-law (same age as the doctor) who had passed from advanced cancer (took him in 10 months). Yet, each of us are fairly healthy. We all garden and take life a little less serious – less stressful, most of the time. However, it seems there is something else afoot (as Sherlock Homes would say). It seems that diet with regard to heart trouble and acquiring cancer are the common thread. I remember Dr. Joel Wallach once mentioning in his famous “Dead Doctors Don’t Lie” audio lecture; U.S. doctors have an average age of death of 56. And, their most common reason for dying so young, is diet; specifically, the absence of Chromium and Selenium (vital trace minerals). Fortunately, the young doctor did not die. The son-in-law did. So, we drink coffee, ponder and cherish these brief visits before the dawn rooster crows. Why, because it’s more than stress and diet. It’s more than the latest food fad. It’s more than getting together to wring our hands and complain. It’s about honest friendship and taking the time to celebrate it. Today, people are divided down into Nuclear Family Units. “What?” That’s comprised of just Mom and Dad and the kids…no old people, no aunts or uncles or cousins sharing a close radius to the home…or living under the same roof. Then comes divorce and even this unit is divided. Suddenly, people are in a situation where no one else is present or near to comfort, guide or just listen when life takes its toll. Ever hear the term, “It’s all in his head”? Of course. Well, emotions create chemicals. We are an electro-chemical being after all. Therefore, chemicals react with what we eat and drink, chemicals we produce when we just sit around or when we exercise. Now, if we also live isolated, under stress and over booked on life in general….and we are missing Vital Trace Minerals…you got it…trouble. Again, why mention coffee at 4:30 A.M.? Because, we need to reach out to others, appreciate friendship, take time to hear the concerns of others and stop focusing too much on ourselves. Then, if we do this and life throws us a curve we have a better chance to recover. So, why would a young doctor not know about selenium or chromium as serious moderators of heart and cancer problems? Training. Very little mention of diet and nutrition are taught in traditional medical schools today. Emphasis is primarily on improving the comfort of the patient by reducing the effects of the disease symptoms. “Fever…bring it down!” Little discussion on the fact that the body uses fever to reduce or even kill pathogens invading the body (for example). I was taken back. Dermatologist? Why? I asked, “Why have you been going to see a dermatologist?” He looked at me as though I’d just landed from Mars. “Because I have this skin disease….”, he responded respectfully. He stared. “How do you know that?” Simple, I said. The bowel is so swollen and inflamed that the good bacteria can’t survive. The bad bacteria have taken over. If you let this go for a few more years, I believe you could become a victim of some much more severe gut disease. So, how many times in the last few years has your doctor discussed what you eat and drink? We set him on a diet of abstinence: no soda pop, no grains, dairy, sugar, nuts, artificial anything and no chemicals that are designed to look like food. Then, we suggested plenty of fresh, clean water, raw veggies, very few fruits (no sugary ones), fish and meat, almond milk and eggs. He came by yesterday after 3 ½ months. “It’s been hell, the cravings drove me crazy but look at this.” He raised his pants leg…no lesions. His arms boasted large patches of new pink skin. His smile was as broad as Dallas. We had supplemented him with a Time Challenger Skin Crème and Time Challenger Original formula to help his mitochondria with the overall repair work. We had also suggested 100 billion units of probiotic with at least 20 strains of bacteria, and we gave him Time Challenger Mineral Complement to provide the selenium and chromium so lacking in severe allergy clients. Nothing else. In six months from now, he will most likely no longer suffer from this condition. His recovery however, should last a lifetime. 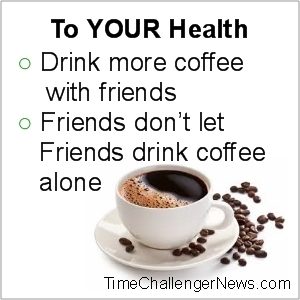 Therefore, the lesson to be learned: drink more coffee with good friends, make more friends, eat wholesome and be willing to ask the medical doctors about nutrition. If they shrug and do not respond hire another one; after all these folks work for us…not the other way around.